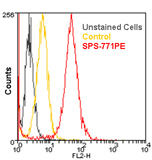 Immunogen: Synthetic peptide corresponding to a portion of mouse Hsp86. Scientific Background: The Hsp90 family of heat shock proteins represents one of the most abundantly expressed and highly conserved families of cellular chaperones whose expression can be upregulated under conditions of cellular stress, and includes cytoplasmic (Hsp90-α/β), ER (grp94), and mitochondrial (TRAP1) localized members. Structurally, Hsp90 is characterized by an N-terminal ATP-binding domain, a medial substrate-binding domain, and a C-terminal dimerization motif. Hsp90 dimers function in cooperation with cochaperones (e.g. Hsp40, Hsp70, Hop, p23) to stabilize a multitude of client protein substrates, including steroid hormone receptors, protein kinases, and transcription factors. The essential binding and hydrolysis of ATP by Hsp90 is inhibited by ansamycin drugs (e.g. geldanamycin, 17-AAG) which occupy the N-terminal Hsp90 nucleotide-binding pocket. Many Hsp90 client proteins such as erbB2/Her-2, c-raf, bcr-abl, p53, and hTERT, are members of well characterized oncogenic pathways, making Hsp90 inhibitors useful anticancer agents. Flow cytometry analysis of 106 Jurkat cells using Hsp90α, pAb (PE conjugate) at a concentration of 10 µg/ml.